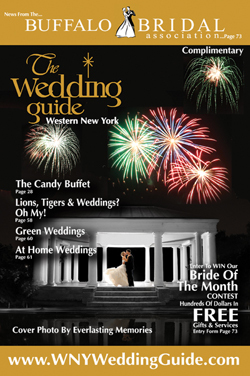 Looking for the perfect venue for wedding rehearsal dinners or bridal showers in Western New York? Wedding rehearsal dinners and bridal showers have to be planned out, just like any other part of your wedding, in order for them to run smoothly and serve their purpose. To make the process simpler for you, we have come up with checklists that will help brides plan their rehearsal dinners and showers, and hopefully, with this information, we can make things much less stressful than they could end up being for you as you approach your wedding day. The wedding rehearsal dinner is essentially a trial run of the wedding procession. 1. Communication with Officiate – Before the rehearsal dinner, sit down and communicate with the person who will be officiating your wedding. If you have any questions about your wedding or want to specify how you want certain things done, this is the time to ask the officiate. An officiate who is experienced will be able to answer any of your questions about your wedding procession, as well as any religious rituals that should take place during your wedding. By the time this meeting is over, the bride and the groom should completely understand what is expected of both of them. 2. Communication with Guests – You should send an invitation to each person who is expected to be at your wedding rehearsal. These invitations should include the wedding rehearsal dinner date and time, the place that the wedding rehearsal dinner will be held at, and for guests who are coming from out of town, directions to the location are always helpful. Specifics on what to wear and what the guests should bring to the wedding rehearsal dinner can also be included in the invites. 3. Schedule for Wedding Day – Each person who attends the wedding rehearsal dinner should be provided with a schedule for the wedding day. This can be given to the guests of the wedding rehearsal dinner at the commencement of the rehearsal dinner. Anyone who is assigned duties should know the locations and times of their duties, as well as what is expected of them before they arrive at the wedding location. Basically, if you write down everything that you are going to need done for your wedding, and make this list as detailed as possible, it will be easier to assign the different responsibilities to guests. 4. Practice for Wedding Day – You should meet with your wedding planner or coordinator before the wedding rehearsal dinner so that you can let her know what you expect from her at both the rehearsal and the wedding. Explain, in detail, how you see your wedding day planning out and work together to figure out who should be walking down the aisle, and in which order. The exit strategy should also be worked out, as well as what the wedding party will be doing during the wedding. The better this is planned out, the smoother the wedding day will go. The bridal shower, which is also known as the couple shower, is a party that is thrown by the maid of honor for the bride-to-be. So, these instructions should be quite useful for the maid of honor. 1. Talk to the bride to find out what she would like for her shower. Think about the theme, whether or not it will be co-ed, daytime or nighttime, and where it will be held. 2. Set a date. About one or two months before the wedding is a great time frame. 3. Make reservations at the place that the bridal shower will be held. 4. Make a guest list. Remember that if you invite someone to the bridal shower, they will also be invited to the wedding. 5. Check with important bridal shower guests to ensure that there are no conflicts with scheduling of the bridal shower. 6. Create a budget with the help of the bridesmaids. 7. Make the invitations, collect guest list addresses. 8. Plan the décor, the flowers, the table linens, music, party favors, and party activities. 9. Place orders with the caterer or bakery and any rental companies. 10. Buy the wedding shower gift for the bride-to-be. 11. Shop for food and drinks. 12. Confirm reservations, orders, delivery times, RSVPs. 13. Prepare the activities and games. 14. Make a floor plan.